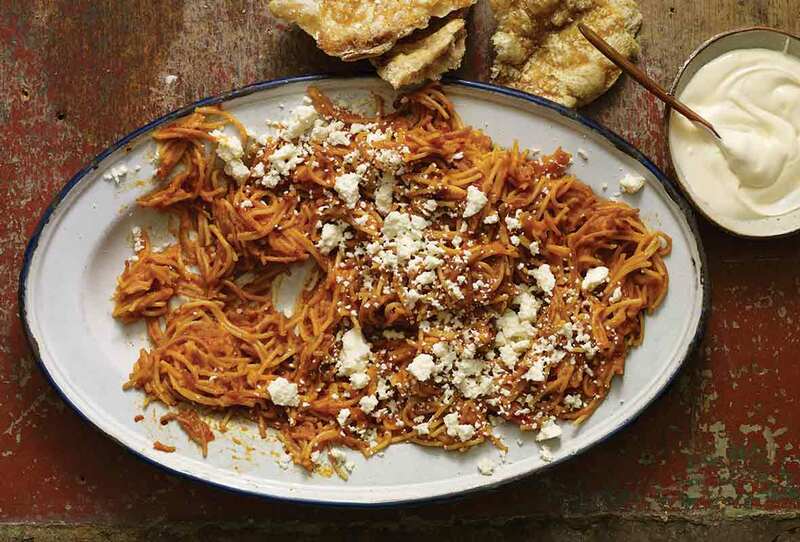 This Mexican spaghetti, or sopa seca de fideo, is authentic as heck and mindblowingly seductive. Translated literally, it means “dry soup with noodles.” And it’s soooo much better than it sounds. 1. Fill a medium saucepan 2/3 full with water and add the tomatoes. Bring to a gentle simmer over medium heat and cook until the tomatoes are softened, 7 to 10 minutes. The skins may split before the tomatoes are softened and that’s okay, just reduce the heat to low. Use a slotted spoon to transfer the tomatoes to a small bowl and let them cool for a few minutes. Reserve the pot of cooking water. 2. When the tomatoes have cooled, use your fingertips to slip off the skins as you hold each tomato over the bowl. (They’ll slip off quite easily.) Add the peeled tomatoes, along with any juices left in the bowl, to a blender along with the garlic, onion, and 1/2 cup reserved cooking water. Blend on high until very smooth, 2 to 3 minutes. 3. In a small bowl, mix together the minced chipotle, adobo sauce, and brown sugar or grated piloncillo. 4. Add 1 tablespoon oil to a large skillet set over medium heat. (We recommend using the deepest, widest skillet you have as the fideo noodles like to jump out of the pan!) When the oil is hot, scatter half the noodles in the pan, stirring almost constantly and reducing the heat if they brown too quickly, until the noodles are a deep golden brown, 4 to 6 minutes. Transfer to paper towels to drain. Wipe out the pan and repeat with 1 more tablespoon oil and the remaining noodles. 6. Add the fried noodles and cook over medium-low heat until they absorb nearly all the sauce, 3 to 5 minutes. Add 1/2 cup reserved cooking water from the tomatoes and cook until all the liquid is absorbed and the noodles are al dente, about 3 minutes longer. Taste the noodles—if they’re still too crunchy or chewy for your taste, add more of the reserved cooking water in 1/4 cup increments, allowing the liquid to absorb the liquid before adding more. 7. Divide the fideo noodles and sauce among plates and pass the crema, crumbled cheese, avocado slices, and chicharrón, if using, on the side. Fideo noodles are slender pasta strands similar to vermicelli or angel hair pasta. In Mexico City they come in various sizes with the most common length about 1 inch. You’ll find fideo noodles at Mexican grocery stores or in the Hispanic foods aisle of some mainstream grocery stores. You can substitute vermicelli or angel hair pasta broken into whatever size lengths your recipe requires or you desire. 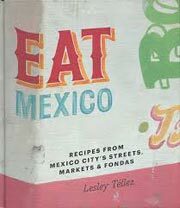 Mexican Spaghetti | Sopa Seca de Fideo Recipe © 2017 Lesley Téllez. Photo © 2017 Penny De Los Santos. All rights reserved. All recipes and photos used with permission of the publisher.